Irrigation water is critical to the economic performance of most of the specialty food crop plants we grow in Sonoma County. In our dry summer climate, maximum productivity can only be achieved with supplemental irrigation. Without irrigation we would not even consider growing most vegetables, fruit trees, or berries. Even the crops we can grow without irrigation like apples, plums, potatoes, Christmas trees, or tomatoes need to have some water that is provided by winter rains and stored in the soil. Sonoma County usually receives about 25 to 50 inches of rainfall in a normal year – differing amounts depending on distance from the ocean, elevation, mountain shadows and weather patterns. Only a small fraction of that, however, is stored in the soil and made available to plants in the spring when growth starts. Most of it runs off. Even less moisture is available to plants in a drought, because the ground’s reserve is depleted by sunny winter days and insufficient replenishment. Making the most of what we have requires water-wise strategies such as: saving as much soil moisture as possible, increasing the organic matter in the soil, irrigating responsibly, not wasting water, and if possible, by only growing crops during the times of year when sufficient water is available. One of soil’s functions is to serve as a water-holding reservoir. Each soil type – sand, loam and clay – has a different water-holding capacity. Sandy soil holds less and clay soil holds a bit more, but on the average our common loam soils hold about two inches of water per foot of rooting depth, which is equivalent to about 0.62 gallons per cubic ft. of soil. This 2 inches of water per foot of rooting depth is an important number to remember for calculating irrigation need. The best way to determine rooting depth is to dig down near some plants – with a backhoe and observe the soil profile. Look at the cut surface of the soil noting where the roots are growing and where they stop. Soil type or rooting depth does not determine how much water a plant uses. Rather, it means that there are different amounts of water stored for the plants to use. Once the soil absorbs its maximum (field capacity), any additional water runs off or percolates deeply beyond the rooting zone. 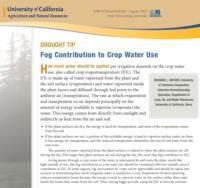 Supplemental irrigation is needed after plants deplete the water that the soil is holding. A common misconception is that plant roots, especially tree crops, go quite deep – typically matching the extent of the branches above ground in an almost mirror image. 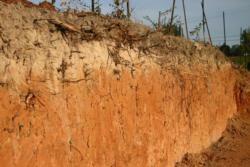 Mostly, this is not true, because of impervious clay layers or various situations that restrict root growth. The roots of our food crops need oxygen, so sometimes rooting depth is limited because there is no oxygen below a certain level. Some soils that are very deep (on valley floors like the Valley of the Moon, Dry Creek, Alexander, or the Russian River Valleys) can have rooting depths down to ten feet. Knowing that most loam soils can hold about 2 inches of water per foot of rooting depth means that those soils might hold up to 20 inches of water available for plants. Some of the soils in the Sebastopol hills allow for good root development down to about 4-5 feet, potentially holding about 8-10 inches of water. Almost all of our rolling hillsides and most of the Santa Rosa plain soils, are quite shallow – typically only about 1.5 feet deep and able to hold only about 3 inches of moisture. Even when deep rooting is possible, most (75-80%) of a tree’s roots are usually within the top 2-3 ft. of the surface. The old adage of watering down deep provides little or no benefit to the plants and if there are no roots down deep, then that water is just wasted – a horrible mistake in a drought year. For most vegetable crops, the top six inches to a foot of soil is considered the active root zone even in deep soils where there are no restrictions to rooting. A number of vegetables, such as tomatoes, melons, squash and corn, can send their roots deeper – down to maybe two feet. When we irrigate vegetables, berries, and even fruit trees we get better performance if good moisture is maintained in the top foot of soil where most of the nutrients, oxygen, and roots are anyway. Soil moisture conservation practices that maintain as much soil moisture as possible for the food crops being grown is the first step to making the most of what is available from winter rains. The most important thing to do is to keep the weeds from stealing the water. Unfortunately, cover crops that normally are our allies in preventing erosion, fixing nitrogen, and increasing organic matter, use water. In a ten day period during nice 70oF spring weather as much as one inch of water can be lost from the soil. Therefore, in a drought situation clean cultivation, spraying herbicides, or applying surface mulches to smother or kill any competing vegetation is critical. This is how non-irrigated apples have been grown in the Sebastopol area since the late 1800’s. Farmers disc or till the soil early in the spring when it is still full of moisture before the cover crop or weeds use it up. Unfortunately, this also increases the risk of erosion, but it is essential when there is no supplemental irrigation water available. Adding compost and tilling it in can increasing a soil’s ability to hold more water by increasing the organic matter content of the soil. This is a long term strategy that might require yearly applications of 5-10 tons of compost over many years, which is expensive. Increasing soil organic matter content by 1% (from 2% to 3%) for example, can increase soil water holding capacity by about 25%, but only in the top 6-8 inches where it has been increased. HOW MUCH WATER DO PLANTS USE? The amount of water plants use is primarily influenced by temperature, i.e., how hot it is for how long. It is influenced by relative humidity and wind velocity as well, but to a lesser extent. 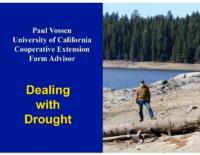 Consequently, water demand is lower in the spring and fall when days are cooler and shorter. The rate at which plants use water is known as the evapotranspiration rate (ET). ET refers to how much water is lost from evaporation at the soil surface and from transpiration which is water vapor lost from leaf surfaces. Sonoma County can be divided into three primary climatic zones based on summer heat and each zone will use different amounts of water. The “Marine” climate zone is our coolest and exists in areas where there is significant summer fog like the Petaluma gap, the Carneros area, the mouth of the Russian River, and immediately adjacent to the coast. Based on forty years of historical climatic data, plants in this zone use about 20 inches of water per year during the growing season from April through October, which is 543,000 gallons per acre. The “Coastal Cool” zone (Northern Sebastopol, Graton, Forestville, Southern Windsor, and the Santa Rosa Plain) is warmer because it gets less fog. Plants there use about 34 inches of water in a typical growing season, which is 923,000 gallons per acre. The “Coastal Warm” zone is our warmest growing region, because it gets the least amount of fog. It consists of most of the northern part of Sonoma County, the eastern hills, Kenwood and Sonoma and plants there use about 42 inches of water per growing season, which is 1,140,000 gallons per acre. There are intermediate microclimates in between these three broad zones and they shift from year to year depending on the strength of the fog intrusion. Breaking down total water use in the growing season to daily or weekly amounts is helpful in scheduling irrigations. Plant water use - or the ET rate - in the spring and fall in Sonoma County is about 0.10 inches per day or about one inch of water use per ten days. 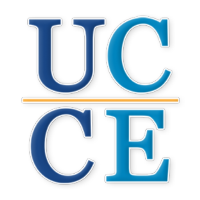 During the hottest, long days of summer, water use or the ET rate can climb to about 0.25 inches per day or about an inch of water use every four days. Daily ET rates can be found in The Press Democrat or on the California Irrigation Management Information System (CIMIS) website representing different weather stations in Sonoma County. Putting in a drip system can increase irrigation efficiency by about 20% because it reduces evaporative losses when sprinklers spray water into the air. Converting daily ET rates in inches to gallons for timing drip irrigation requires an area factor, which could be the size of the trees, or the dimensions of a vegetable or berry bed. The area in square feet is determined by looking at the crop and estimating the amount of surface area covered by green foliage. In an orchard, if the trees are only occupying half of their allotted space (for example 6 ft. x 6 ft. = 36 ft2) when planted 6 ft. x 12 ft. apart then their water use would be 50% of ET. If a live cover crop or green weeds are growing between the trees, then the area coverage factor becomes 100% because the whole surface is using water. 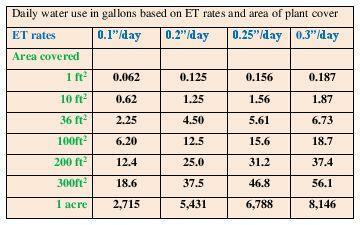 See the table below for examples of daily water use in gallons for different daily ET rates and areas of plant coverage. 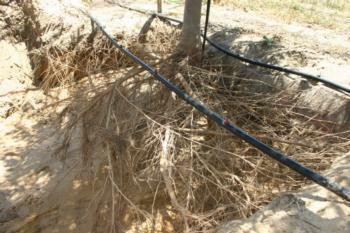 The amount of water being applied in a drip irrigation system is determined by the flow rate and number of emitters in a given area. These ET rates are “potential” use rates that plants will use if there is plenty of water available to them. Limiting water availability will cause plants to reduce photosynthesis and grow less, while also using less water. As water stress increases, plants almost completely shut down and stop growing in an attempt to survive. In that scenario, they use much less water than full ET. But, of course, they do not look good; they grow slower and fruit size is reduced. Under severe water stress conditions, plant leaves wilt and sunburn and some plants even die. Vegetables planted in cool months require less water than warm season plants because they are growing at a time of year when water demand is lower. Growing broccoli, cauliflower, peas, lettuce, onions, spinach, mustard greens and other cool season vegetables during the heat of the summer – when they normally would not grow well anyway – would require lots of extra water just to help them stay cool. So they should only be grown in the fall, winter and spring. Warm weather vegetable crops see their water demand increase as they get bigger – peaking at maximum plant size, usually in late summer. In general, irrigation is needed if vegetables wilt or show signs of drought stress. Some of the large-leafed vegetables, however, such as squash, pumpkin, cucumber, etc., will wilt in the afternoon as a response to heat, but recover later when the sun goes down. This is normal. It doesn’t necessarily mean that they are in need of more water. If the leaves regain their upright position in the morning, they don’t need additional water until the soil has dried out more. Fruit trees are more deeply rooted than annual vegetables and can tap into approximately four to six inches of stored water held in a loamy soil. They develop most of their leaves and shoots before the middle of June. This growth is important for next year’s crop development. Minimizing drought stress early in the season with irrigation water is the least disruptive to fruit trees. Water stress later in the season (summer and fall) has little or no effect on flowering or fruit set next year. Fruit trees in deep soil that have received adequate seasonal rainfall to fill the soil to field capacity can survive and produce better because they have a longer reserve of spring moisture allowing them to grow normally. That is why we may have “dry-farmed” trees that seem to do quite well. They often can survive very dry conditions (one-half to one-fourth normal ET rates) later in the season because they already grew their new shoots, flowered, set fruit and fulfilled their life’s cycle. Almonds, figs and olives are the most tolerant of drought. Apples, apricots, cherries, pears and prunes are somewhat drought-tolerant. Nectarines, peaches and citrus are most dependent on adequate water. Removing most or all of the fruit from apples, pears, peaches, nectarines, plums (prunes) and citrus can help the trees survive a very dry year by using about 20 to 30 percent less water. Of course, fruit thinning also will improve the size of the remaining fruit. This is especially true of varieties that ripen late. Removing the fruit from olives, almonds, or walnuts, however, doesn’t cause much of a reaction in the plant and saves little or no water. Modest branch thinning and no topping cuts during the dormant season is the best for fruit trees. Some water can also be saved by summer pruning in May, which is thinning out and topping branches when they have leaves on them. This reduces total leaf area and reduces water use somewhat too.